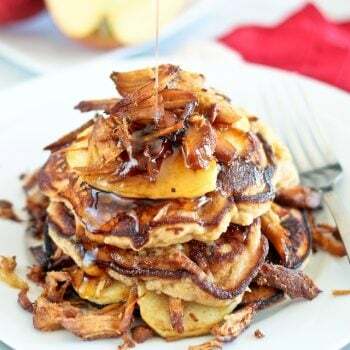 Since my daughter was at home for the past two weeks with her boyfriend and brand new baby girl, I had better things to do than to spend hours in the kitchen, cooking up a storm. Tons of cuddles and kisses had to be given, bottles had to be fed and diapers demanded to be changed. And quite a bit of consoling needed to be done, too. In other words, this foodie had a blast playing grandma. Still, I had to get some work done from time to time and also had to feed my esteemed guests… so a minimum amount of cooking needed to take place. 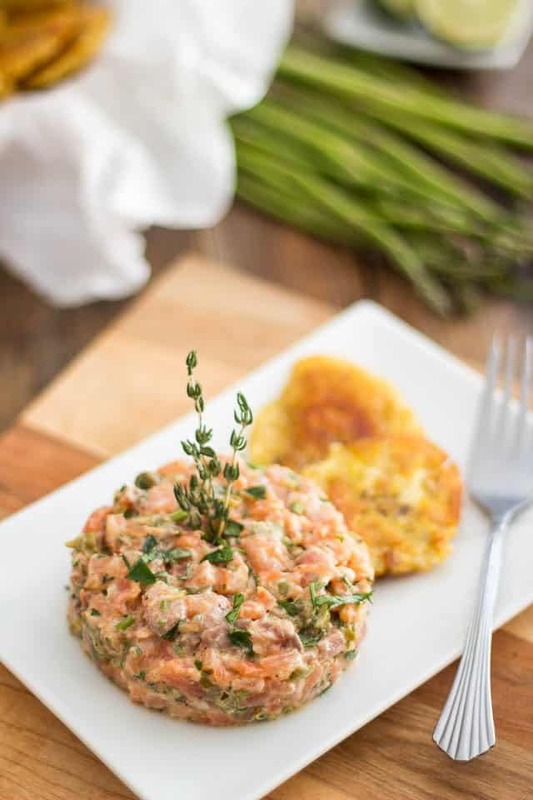 This Two-Salmon Tartare I pretty much made at my daughter’s request. You see, she’s a huge fan of everything “raw fish” and she kept telling me about that amazing salmon tartare she’d recently had and how she would LOVE to have it again and that maybe I could whip one up for her. The tartare in question had been prepared using 2 kinds of salmon, fresh and smoked and it was apparently to die for. Boy am I glad I did, though. My daughter was right! This stuff is so crazy good. 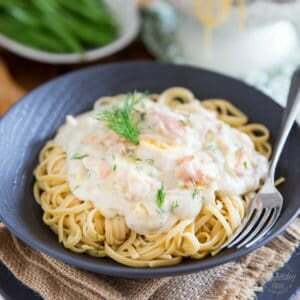 The addition of smoked salmon does so much for this classic dish, I could’ve easily kept eating it until the end of time. 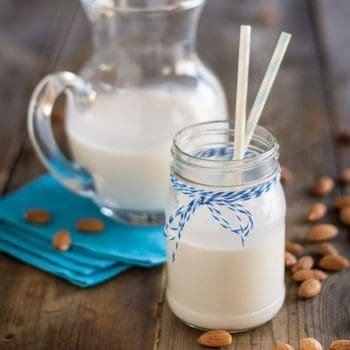 And the best part is, it’s crazy easy to make! 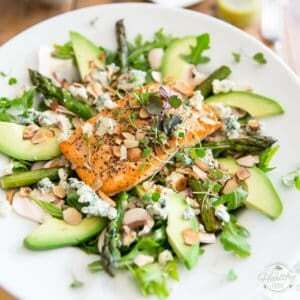 Since you’re not going to cook the fish, make sure you use the freshest fish you can get your hands on. Also, if the skin is still present on your salmon fillet, you will have to remove it. 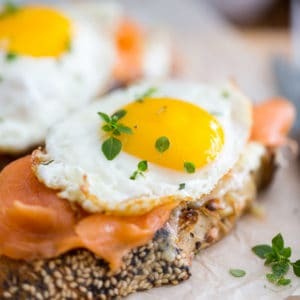 If you need help with this, check out recent post on Salmon Gravlax, where I explained how to get it done. Or, if you’re really not comfortable doing it yourself, ask your fish monger to do it for you. Then, using a sharp knife, cut the fresh salmon and smoked salmon in very small cubes of approximately 1/4-inch. This is fairly important: if the cubes are too big, they will have a rather unpleasant mouth-feel to them; if you go overboard and reduce your fish to mush, the visual aspect of your dish will suffer a great deal. 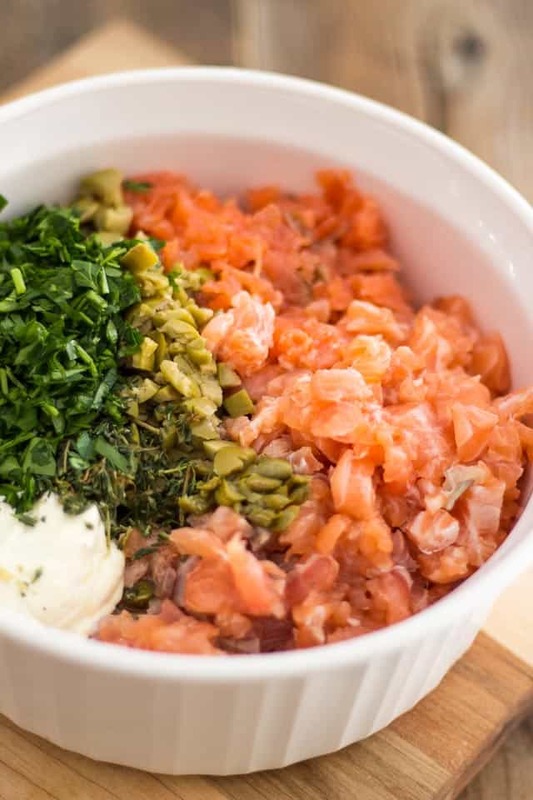 Alright, now that you got your fish all chopped up, throw it in a mixing bowl along with along with some paleo mayo, evoo, parsley, lime juice, olives, capers, caper brine, mustard, black pepper and cayenne pepper and mix delicately until well combined. Cover that with plastic film and place in the refrigerator to marinate for about 2 hours to allow the mixture to firm up a bit and the flavors to fully meld. If you were in a real pinch, tough, you could very well get away with serving your tartare right away… trust me, it’ll still be phenomenal! 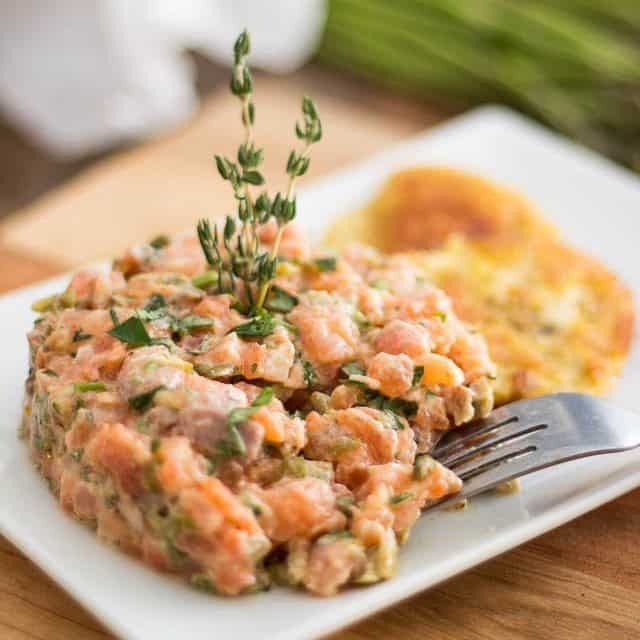 When you are ready to serve your salmon tartare, divide the mixture into 4 equal servings; press each serving into a round cookie cutter and pack the fish down lightly with a spoon. I chose to use an 88mm cookie cutter, but you could very well use a narrower ring to make taller fish towers, if you wanted to. I wouldn’t recommend going larger than 88mm, though, unless you were hoping to serve very thin, pancake-like, raw salmon pucks. 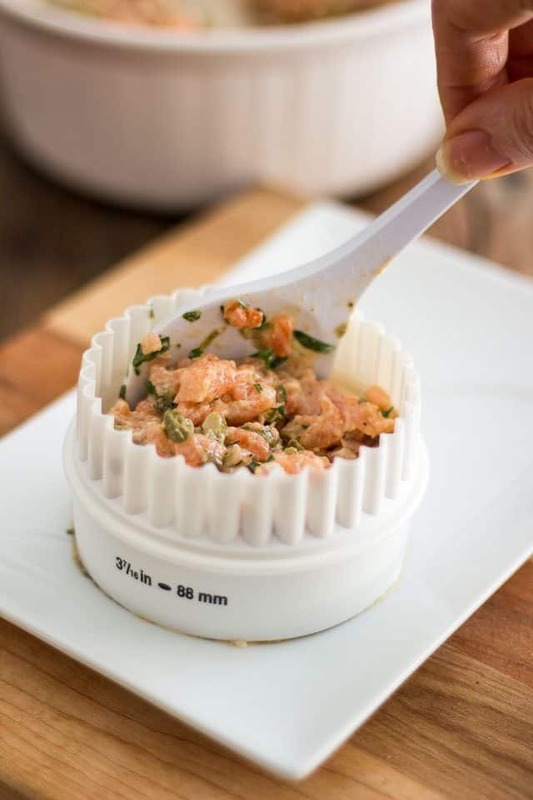 Oh, and if you didn’t have any cookie cutters on hand, you could also use an empty can of tuna or salmon from which both ends have been removed. 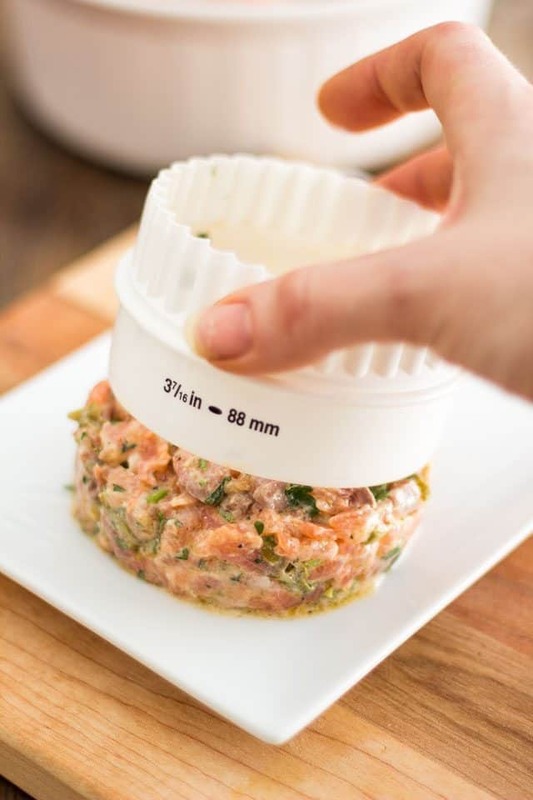 Or, you could also line 4 ramekins with plastic film, fill them up with the fish mixture and pack it down slightly before sending your tartare to the fridge, then flip to unmold when ready to serve. 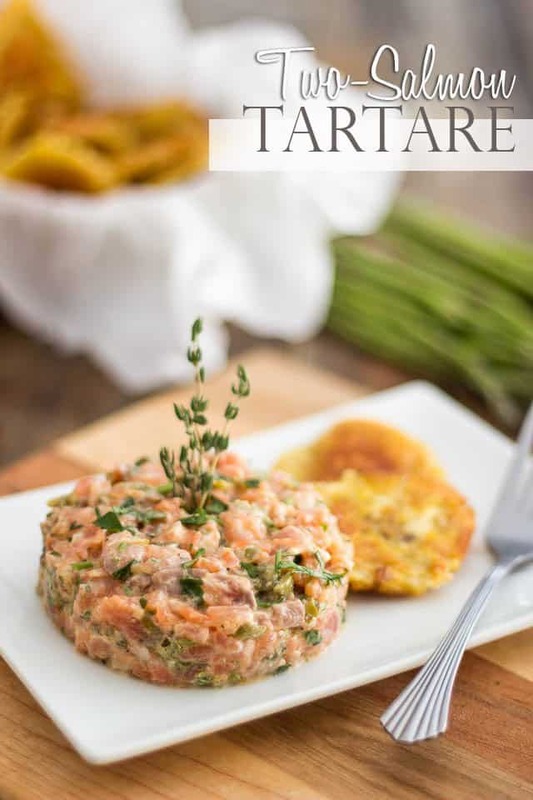 At the moment of serving, garnish your tartare with fresh herbs and a dribble of extra-virgin olive oil if desired. Typically, tartare is served with something crunchy. I bet these Rosemary and Sesame Paleo Crackers would be a fantastic match. 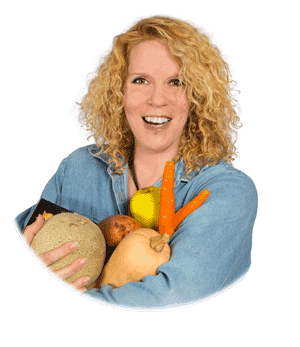 Fresh vegetables such as cucumber, raw broccoli or sliced carrots are another great option. As for me, I chose to serve mine with fresh tostones. I wasn’t exactly convinced that this combination of flavor would be all that great, but it worked surprisingly well! 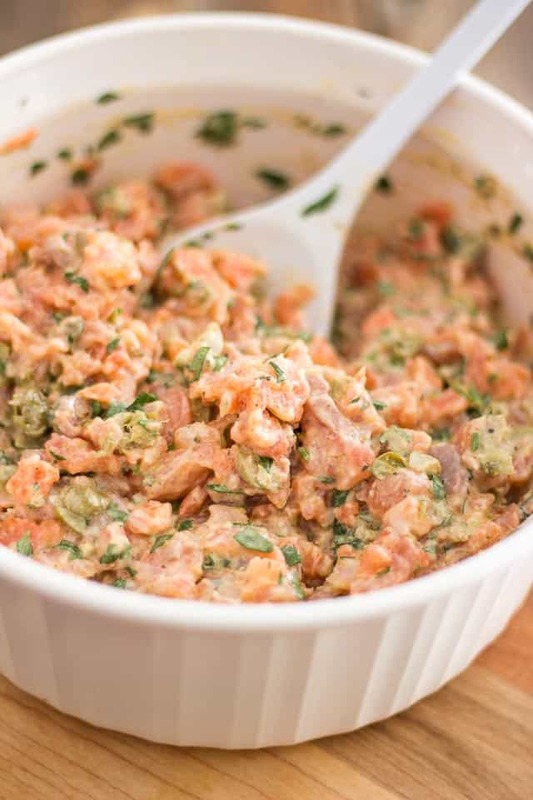 If you’re already a fan of salmon tartare, I get the feeling that this will become your new favorite recipe. 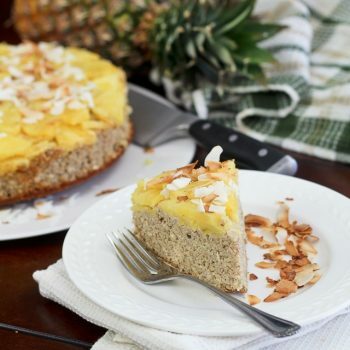 And if you’re not a fan, this might very well be the recipe that’ll make you a believer. Perhaps next time my daughter visits! 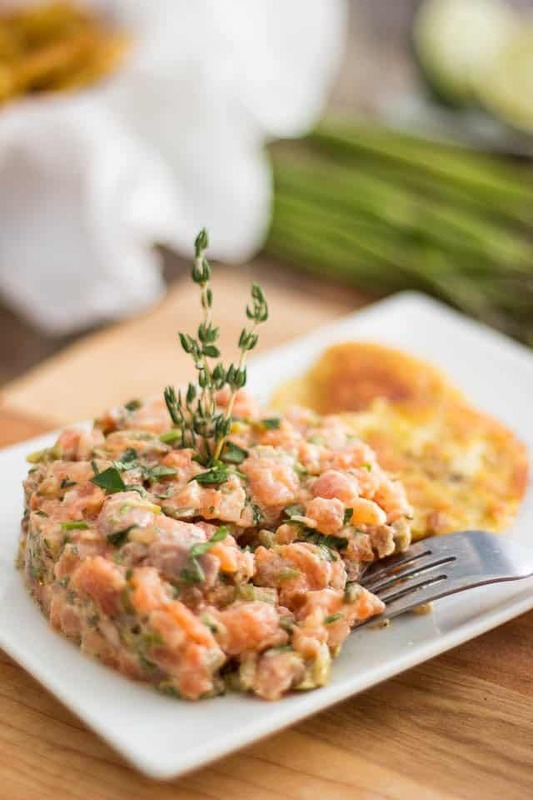 Using a sharp knife, cut the fresh salmon and smoked salmon in very small cubes of approximately ¼-inch. 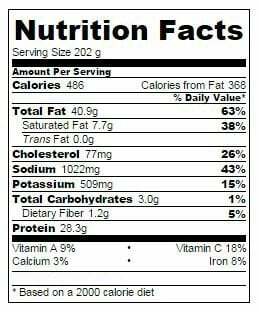 Throw that in a mixing bowl along with the rest of the ingredients and mix delicately until well combined. Cover with plastic film and place in the refrigerator to marinate for about 2 hours to allow the mixture to firm up and flavors to fully meld. 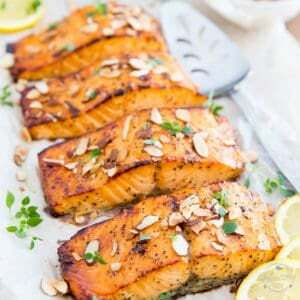 When ready to serve, divide the salmon into 4 equal servings and press each serving into a round cookie cutter. Pack the fish down lightly with a spoon and remove the ring. 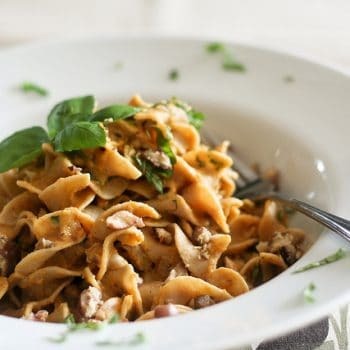 Garnish with fresh herbs and a drizzle of extra-virgin olive oil if desired. 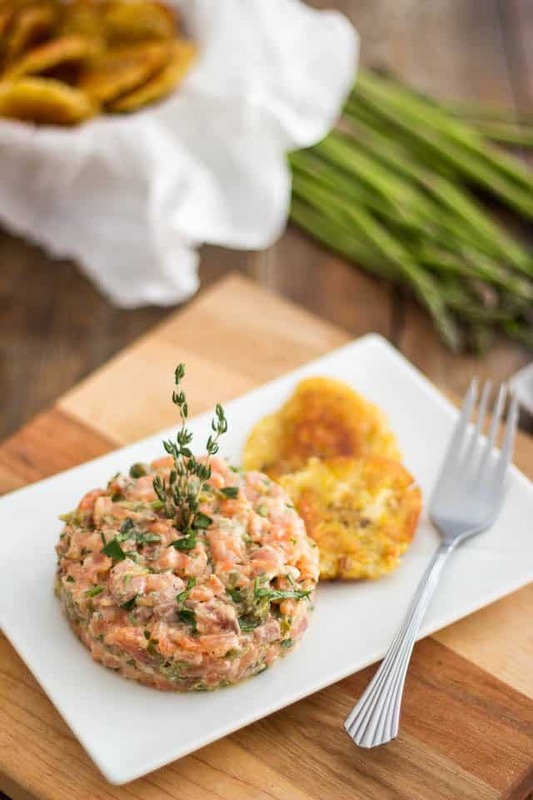 Serve immediately with something crunchy like crackers, tostones or fresh vegetables.